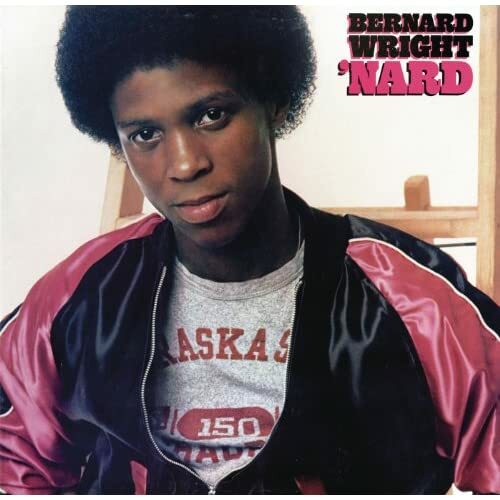 After hearing “‘Nard” the one definitive impression you’ll have is that New York pianist Bernard Wright has a large number of musical influences ranging from Herbie Hancock,George Duke,Lenny White and of course Dave Grusin (his producer) and Miles Davis.But one thing the 16 year old musician does very well is find unique and creative ways of gathering his influences into his own special kind of musical sound. Released on vinyl in 1981 on GRP “‘Nard” is at it’s core a funk-jazz album,but all that means is that the backup has a rhythmic R&B style over which Wright plays very memorable and often improvised solo’s on his acoustic piano,Fender Rhodes and sometimes the occasional synthesizer.But only on the spiky funk of “Just Chillin’ Out” and “We’re Just The Band” do synths play that big a part. “Master Rocker”,”Spinnin'”,”Firebolt Hustle” and the jamming “Bread Sandwiches” are all based on a chunky backup of guitars,rhythms and often sudden melodic exchanges,that plus the comically absurd vocals of “Haboglabotribin'” brings up the George Duke connection.The general sound (especially on the one ballad in Weldon Irvine’s “Music Is The Key” showcases Bernard Wright as an artist with a firmly established 1970’s-based sound.. The electronic and glossy sheen of 1980’s style jazz-funk an R&B in general are not to be found in huge doses on ‘Nard’.But thanks I’m sure to poor promotion on GRP’s part this album (and artist in general) have gone almost forgotten until this CD reissue.I brought it only on customer recommendation and I couldn’t be more pleased with what I heard.And despite it’s often hefty price tag ‘Nard’ will be more then worth the investment.I recommend it not only as an ear pleasing guidebook for other aspiring young musicians but to any fan of late 70’s/early 80’s transitional jazz-funk in general.